An inquest has found that a bomb disposal expert from Cornwall was unlawfully killed in Afghanistan. 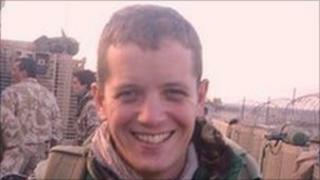 Capt Daniel Read, 31, from Newquay, was killed in January in north Helmand. Kent-born Capt Read from 11 Explosive Ordnance Disposal Regiment had cleared three improvised explosive devices (IEDs) when he was killed by a fourth. The Coroner at Truro Council Chambers said Capt Read, from 11 Explosive Ordnance Disposal Regiment, Royal Logistic Corps, was unlawfully killed. The officer had been clearing an area in north Helmand that had been chosen as a new patrol base, which was said to have been littered with IEDs. The inquest heard from Capt Read's wife who raised concerns about his fitness after he returned to his unit following injury. Lorraine Read said she was worried about her husband's ability to hear orders, but he had been passed fit. The inquest in Truro also heard how a helicopter called to evacuate Capt Read hit a tree on landing and was unable to take off. But a medic on the helicopter said it had no bearing on the outcome as Capt Read would not have survived the blast injuries. Before his death in the Musa Qala area in the north of Helmand province on 11 January, Capt Read had dealt with 32 IEDs in Afghanistan.